Famous for its spectacular mountain vistas, abundant wildlife, glaciers, vast expanses of sub-arctic tundra, and North America's highest mountain, Mount McKinley, Denali National Park and Preserve is a real wilderness area that attracts millions of visitors each year. More than six million acres are home to grizzly bears, caribou, moose, Dall sheep, wolves and numerous species of birds. The main attraction is the snow-covered massif of Mount McKinley, towering 20,320ft (6,096m) above the peaks of the Alaska Range, the definitive symbol of untamed Alaska. On a clear day its twin peaks can be seen from Anchorage, 149 miles (240km) away. 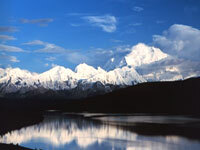 The Alaska Range divides the park into north and south sides, with the majority of visitors accessing the north where the main visitors centre is located. Mountaineers seeking out the challenges of Mount McKinley need to access the park from the south side. Other peaks offer excellent climbing opportunities for those not wishing to risk the mountain that has earned its reputation as one of the world's most difficult climbs. The park region also offers a wide variety of other activities including day hikes or backcountry hiking, camping, mountain biking, whitewater rafting and ice climbing. Early June or late September is the best time to avoid the crowds.